Ford GT40 car books cover the development of this legendary automobile. The Ford GT40 was a high performance sports car and winner of the 24 hours of Le Mans four times in a row, from 1966 to 1969. Ford GT40 Super Profile by John Allen (1983). A solid general overview of GT40 development and detail. Contains many excellent component photos and complete specifications in addition to supporting text. 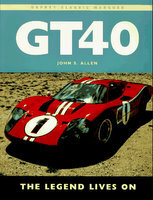 The Ford That Beat Ferrari: A Racing History Of The GT40 by John Allen (2005). On the cover is the most extraordinary GT40 of all: the 1075, which won six international endurance races and covered 11,963 racing miles, on its way to victory in the 1969 Sebring 12 Hours, driven by Jackie Ickx and Jackie Oliver. Throughout are photos and stories that make this book a must for any serious racing enthusiast or Ford aficionado. 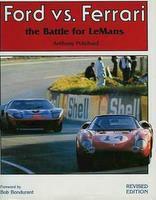 Go Like Hell: Ford, Ferrari And Their Battle For Speed And Glory At Le Mans by A J Baime (2009) tells the remarkable story of how Henry Ford II, with the help of a young visionary named Lee Iacocca and a former racing champion turned engineer, Carroll Shelby, concocted a scheme to reinvent the Ford company. Road And Track On Cobra, Shelby And Ford GT40, 1962-1992 by R M Clarke (1993). Road tests, racing, new model reports and more on the legends. 25 great articles from past issues of Road & Track tell it like it was and recreate the glory days of Shelby's great racing career. Technical analysis, comparisons, and more on the Lone Star Cobra, 260, 289, 427, replicas, GT40, Mark II, Mustang, GT350 and GT500. Ford GT40 & GT Ultimate Portfolio 1964-2006 by R M Clarke (2007). Henry Ford, having been rejected by Ferrari, vowed to beat him on the race tracks of the world. It was the spark that ignited what was probably the most exciting era in Ford's history which began in 1964. When released in Dearborn the GT40 was probably the prettiest racing car ever designed up to that time. It looked sensational and was undoubtedly very fast, but its aerodynamic performance left much to be desired, as did its reliability. It failed to finish in such events as the Nurburgring 1000 kms, Le Mans 24-hour and the Nassau Tourist Trophy, but Ford regarded these outings as part of the learning curve. In 1966 came the much modified Mark 2 version and with this car success started to come Ford's way. Henry Ford's dream was realized when the three surviving GT40s finished 1-2-3 at Le Mans. Although the GT40 continued to be raced after the 1967 season, it was with private teams rather than from Ford itself, where it became a legend in its own lifetime. 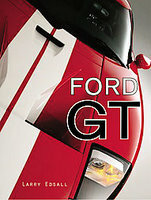 Ford GT: The Legend Comes To Life by Larry Edsall (2004). The Ford GT is the modern version of the incredible GT40, a car created by Ford in the 1960s to beat the Ferraris at Le Mans, which they did! The success of the original GT40, coupled with its great looks, made it one of the most popular cars in automotive racing history. 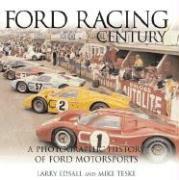 Ford Racing Century: A Photographic History Of Ford Motorsports by Larry Edsall (2003). A photo-driven look at Ford's voluminous racing history in America. This rich history begins with the 1901 race in which Henry Ford defeated Alexander Winton in a 10-lap race on a one-mile oval at the Detroit Driving Club and covers racing through today. 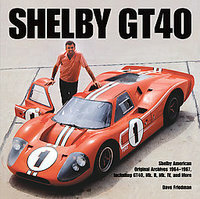 The book includes great Ford racing stories such as the Miller Ford Indy program, development of the Gurney-Westlake Ford V-8, and the 1962-70 Ford Total Performance program, the Trans-Am racing program, the NASCAR racing program, the rich Ford drag racing history, landspeed record Fords, the Shelby programs, the GT-40, and even a section on sport compact drag racing today. Shelby GT40 by Dave Friedman (2006) covers the Shelby team's GT racing program from 1964 to 1967 from Shelby's California shop and early test sessions to Ford's all-out assault on Le Mans and its all-American victory in 1967. 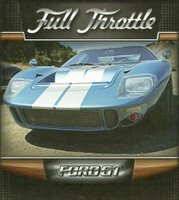 Ford GT40: An Anglo-American Supercar Classic by David Hodges (1998) recalls the GT40's six epic seasons of racing and the legacy that it left on international motorsports. 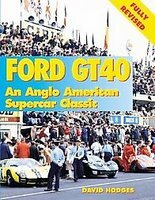 Ford GT40 Prototypes And Sports Cars by David Hodges (1970) is a well-preserved copy of this scarce history of Ford's onslaught on Le Mans and the cars on which their success was built. 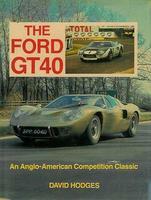 The Ford GT40: An Anglo-American Competition Classic by David Hodges (1984). The story of the classic confrontation between the classic Ford GT40 as it took on - and beat - the all-dominant Ferraris at Le Mans. A story of hard work, dedication, disappointment, tragedy and ultimately of complete and repeated success. Recollections of six epic seasons of endurance racing and of the legacy they left to international motorsport form a fascinating repeat view of what many regard as the golden period of the postwar era. Includes a record of ownership and ID of each car, plus a race record listing the fate of all GT40s entered in major events. 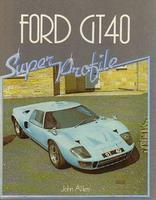 Ford GT40: Production And Racing History, Individual Chassis Records by Trevor Legate (2002). 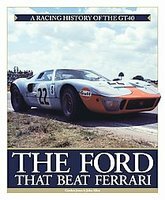 The definitive development, production and racing history of Ford's Ferrari beating sports racing car, winner at Le Mans 1966 through 1969. 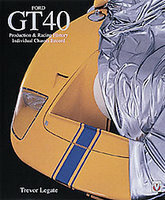 Includes individual chassis record and illustrated GT40 parts list. 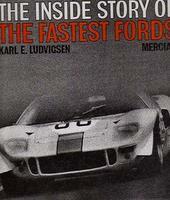 The Inside Story Of The Fastest Fords by Karl Ludvigsen (2001). The design and development of the Ford GT racing Cars. An excellent insight into this most important purpose built racing cars, the book has many cutaway design drawings that show from all angles the refinements that evolved, the problems that did not show up in test room conditions that only race conditions will highlight, such as the early windscreen problems. All chassis are detailed to show even minor differences in this, the most important of Fords racing effort, to take the Le Mans Race victory from Ferrari. Ford GT40 And GT70 by Colin Pitt (2008). GT40, GT70 and the new Ford GT. 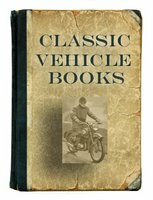 A limited edition book of reprinted automotive magazine articles. 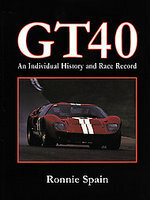 GT40: An Individual History And Race Record by Ronnie Spain (2003). In this comprehensive history of Ford's GT40, Ronnie Spain describes the development of the marque and features chassis records and photos of each and every car built. 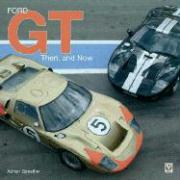 Ford GT: Then And Now by Adrian Streather (2006) contains new information and a different view of the Ford GT legend. Drivers have been interviewed. Never before seen historical and new photographic records have been included. Some of the old myths and legends have been revisited. Read more about the Ford GT40 racing history and the battle with Ferrari.